VCU beats Richmond for the second time this season to advance to the A-10 quarterfinals. The Rams will meet top seed Dayton Friday at noon at the Coliseum. Marlene Stollins’ VCU club is off to a 9-1 start this season. 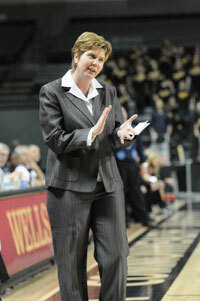 RICHMOND, Va. – Marlene Stollings rebranded her VCU Women’s Basketball program over the summer. Although she toyed with the term “High Octane” at times during her first year as VCU coach, she christened her program “The Fury”, a name which draws from same kinetic roots as Shaka Smart’s “Havoc”. While The Fury has some undeniable marketing panache, the makeover appears to have been more than cosmetic. With a convincing 85-64 victory over Manhattan Wednesday afternoon, Stollings, the Rams and Fury moved to 9-1 this season. It’s just the third 9-1 start in school history, and VCU’s current eight-game winning streak is the second-best for the program. Last season, Stollings’ first at the helm of the VCU program, the Rams finished 11-19. Like Havoc, Fury equates to high-energy basketball. Not only do the Rams pressure the ball to the tune of 23 turnovers per game – they forced 25 Wednesday – but Stollings’ blender offense is perpetually set on liquify. The Rams attack the lane and kick out for 3-pointers with abandon. In ten games this year, the Rams are averaging 80.8 points and 27 three-point attempts per game. Last season, VCU averaged just 59.1 points per game and a little more than 15 three-point tries. 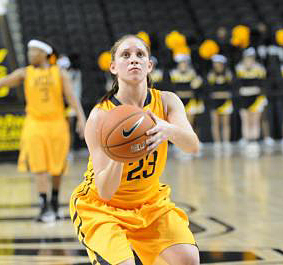 Freshman Jessica Pellechio hit nine 3-pointers in VCU’s win over UMKC last week. RICHMOND, Va. – Jessica Pellechio hit nine 3-pointers in a win over UMKC on Nov. 20, but she might be surprised to learn that she’s not even the record-holder in her own locker room. Rams’ Coach Marlene Stollings once drained 10 treys in a game at Ohio University. Pellechio needn’t fret, she might be the Rams’ best shooter in years. Pellechio, who is averaging 14.0 points per game, has already hit 19 three-pointers in five games and has attempted 56. VCU’s single-season records of 94 made threes and 226 attempts are officially on alert. Last year, Robyn Hobson led the Rams with 25 made threes the entire season. Pellechio’s emergence is no accident. Stollings says she has to practically throw her out of the gym most days. In addition, the 5-foot-8 guard from Annandale, N.J. has managed to surround herself with some outstanding coaching along the way. In recent years, the sweet shooting guard has received instruction from the leading scorers in both Ohio and New Jersey high school history, women who rank among the top 25 all-time nationally in girls basketball history. Since the eighth grade, Pellechio has worked with shooting coach Kristen Somogyi. Somogyi is the leading scorer in New Jersey high school basketball history, girls or boys. She poured in 3,899 points at St. Peter’s High School in New Brunswick from 1989-92, a mark which ranks 10th nationally in girls high school basketball history, according to the National Federation of State High School Associations. She later played collegiately at Virginia and Rutgers and currently works as a teacher and AAU coach in the Garden State.